No offense to my Chinese friends but, most people do not like Chinese products. Here is the irony though, here in the US, Chinese products are everywhere. The last time I check, Disney souvenir items are mostly from China. I refrain from buying $12.50 Disney mug with tag made from China because back home, I can find a Disney mug for 10 pesos at the wet market. Not only that, products which are made in China are sold cheap and the quality is always not good. If I send a souvenir item back home, someone will be offended if they see that it's made in China. They always think that it is not original. Remember the big debate of the US Olympic Athlete's uniforms? It was an iconic Ralph Lauren product which is an American Brand but, manufactured in China. Ironic right? In today's global economy, Chinese products are rampant in the stores such as Walmart. Check out your namebrand shoes, I bet they are made in China. Glad to know that when I check Victoria's Secrets' beauty products, they are all made in the USA. If you see a made in China tag then, you know what it means right? 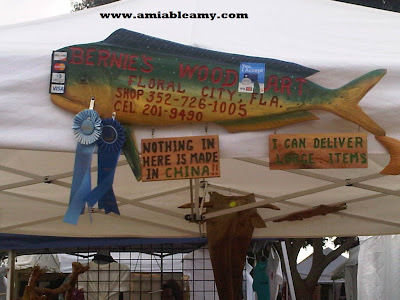 I took this picture in one of the vendors and it emphasize, "nothing in here is made in China". Do you think this sign is offensive?